Definition at line 1980 of file lscript_tree.h. Definition at line 1983 of file lscript_tree.h. Definition at line 1988 of file lscript_tree.h. Definition at line 8113 of file lscript_tree.cpp. 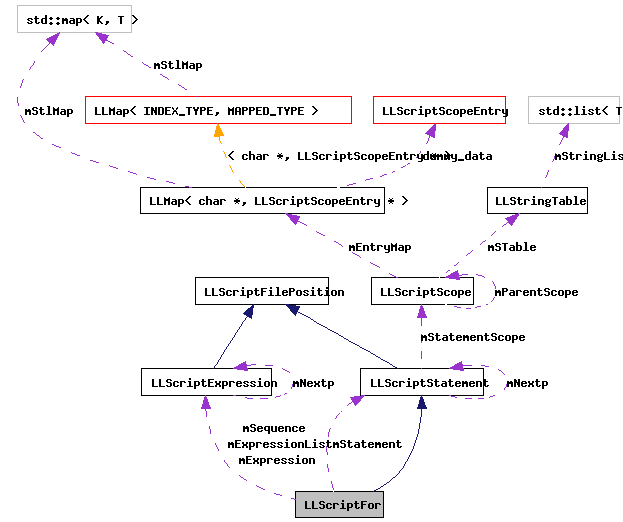 Definition at line 8118 of file lscript_tree.cpp. References LLScriptByteCodeChunk::addByte(), LLScriptByteCodeChunk::addBytes(), LLScriptByteCodeChunk::addJump(), LLScriptByteCodeChunk::addLabel(), FALSE, LLScriptFilePosition::fdotabs(), gErrorToText, LLScriptGenerateErrorText::getErrors(), LLScriptStatement::gonext(), gTempJumpCount, LOPC_JUMP, LOPC_JUMPNIF, LSCP_EMIT_ASSEMBLY, LSCP_EMIT_BYTE_CODE, LSCP_EMIT_CIL_ASSEMBLY, LSCP_PRETTY_PRINT, LSCP_PRUNE, LSCP_TO_STACK, LSCP_TYPE, LSCRIPTDataSize, LSCRIPTOpCodes, LSCRIPTTypeByte, LSPRUNE_DEAD_CODE, LST_INTEGER, mExpression, mExpressionList, mSequence, mStatement, mType, NULL, LLScriptStatement::recurse(), LLScriptExpression::recurse(), S32, and TRUE. Definition at line 1996 of file lscript_tree.h. Definition at line 1997 of file lscript_tree.h. Definition at line 1995 of file lscript_tree.h. Definition at line 1998 of file lscript_tree.h. Definition at line 1999 of file lscript_tree.h.